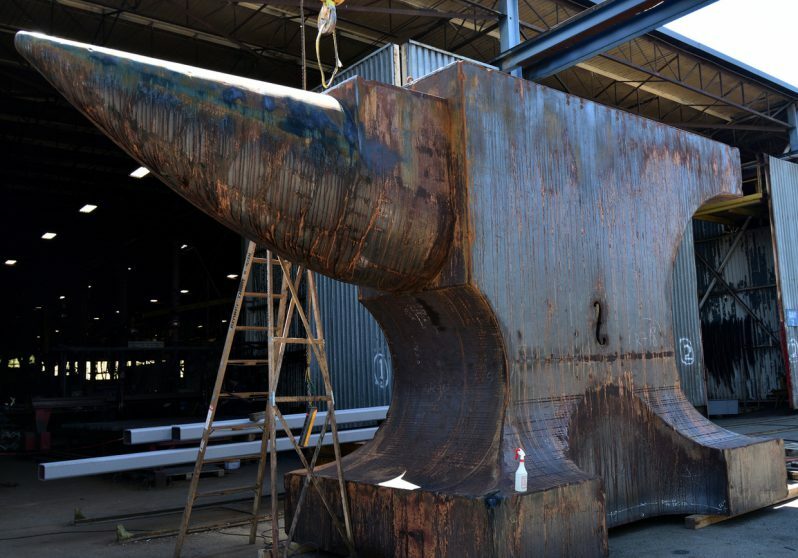 VANCOUVER, CANADA – The Vancouver Biennale 2018 – 2020 will install Maskull Lasserre’s dramatic Acoustic Anvil: A Small Weight to Forge the Sea in Leg-In-Boot Square from 10:30 am on Thursday, July 19, 2018. The second sculpture of this year’s Biennale follows on the success of Saudi Arabia-based artist Ajlan Gharem’s Paradise Has Many Gates, unveiled in Vanier Park last month. Maskull Lasserre’s nearly three-by-eight-metre monolithic red sculpture in the nondescript Leg-In-Boot Square along the seawall will have an immediate visual impact and is in keeping with the Biennale’s commitment to “activate, animate and “re-IMAGE-n” public space.” Lasserre’s sculpture, emblematic of the essential forger’s tool, draws attention to the nearly unrecognizable industrial history of False Creek. Historically, Leg-In-Boot Square was a place of industry, forges, boat building and stevedores. At one point it housed a police station where a human leg, still trapped in a boot, was displayed in the hope that someone would lay claim–now memorialized in the square’s name, although the leg’s origin was never discovered. The industrial history of False Creek was all but erased in preparation for Expo ’86, the 1986 World’s Fair, and the area was reimagined as a residential project that has now become a model for housing communities around the world. Acoustic Anvil: A Small Weight to Forge the Sea is the physical convergence of both real and imagined histories, relationships, and resonances that mark this seemingly silent site.